Variants in the PLPP3 gene encoding for lipid phosphate phosphohydrolase 3 have been associated with susceptibility to atherosclerosis independently of classical risk factors. PLPP3 inactivates lysophosphatidic acid (LPA), a pro-inflammatory, pro-thrombotic product of phospholipase activity. Here we performed the first exploratory analysis of PLPP3, LPA, and LPA receptors (LPARs 1–6) in human atherosclerosis. PLPP3 transcript and protein were repressed when comparing plaques versus normal arteries and plaques from symptomatic versus asymptomatic patients, and they were negatively associated with risk of adverse cardiovascular events. PLPP3 localized to macrophages, smooth muscle, and endothelial cells (ECs) in plaques. LPAR 2, 5, and especially 6 showed increased expression in plaques, with LPAR6 localized in ECs and positively correlated to PLPP3. 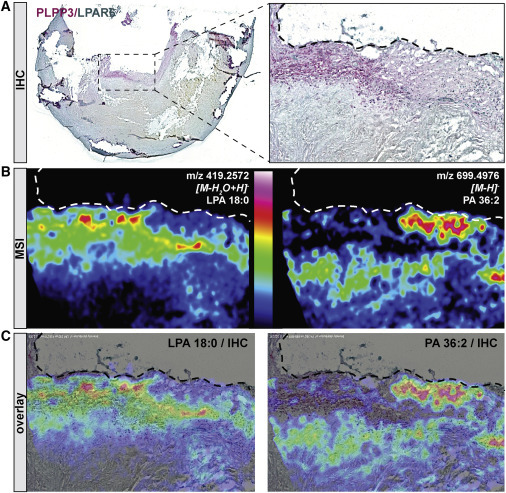 Utilizing in situ mass spectrometry imaging, LPA and its precursors were found in the plaque fibrous cap, co-localizing with PLPP3 and LPAR6. In vitro, PLPP3 silencing in ECs under LPA stimulation resulted in increased expression of adhesion molecules and cytokines. LPAR6 silencing inhibited LPA-induced cell activation, but not when PLPP3 was silenced simultaneously. Our results show that repression of PLPP3 plays a key role in atherosclerosis by promoting EC activation. Altogether, the PLPP3 pathway represents a suitable target for investigations into novel therapeutic approaches to ameliorate atherosclerosis.